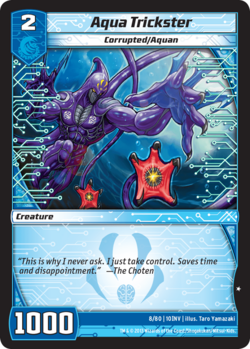 When I see archetype-specific support in Kaijudo, I stop and take notice. 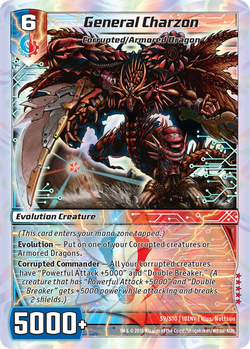 I mean, we get some cool tribal interactions every now and again, but unless a creature type has a bunch of relevant Evolutions, it doesn't impact gameplay. The obvious exception are the Dragons, whom had an entire set dedicated to them. Dragons emerged as a viable deck immediately, and have remained a tournament powerhouse ever since. Enter: Corrupted creatures. Invasion Earth fast approaches, and it is a set largely driven by storyline considerations originating with the animated series. The evil Choten has used his influence over the Water civilization to warp friendly creatures into corrupted monstrosities. He launches an all-out attack on earth, breaching the veil with the vicious Squillace Scourge leading the charge. With almost twenty pieces of support in a 90 card set, could it be that Wizards of the Coast has hand-fed us another tournament-ready archetype right out of the box? Let's take a closer look. Corrupted creatures are inherently aggressive. Most of them grant a global effect to each of your Corrupted creatures, meaning there is strength in numbers. We want to be positioned as a low-end creature deck, and we want to end the game quickly. The primary civilization is Water, and each other civilization is dipped into via multicivilization creatures. How many colors can we conceivably play? The more Corrupted creatures, the better, but will we be slowing down the deck too much? Since our Corrupted army is only formidable while we control multiples, it stands to reason that we don't want to function as a rush deck, attacking at every possible opportunity. 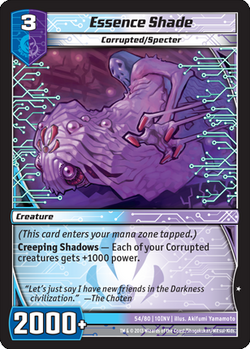 If the Corrupted deck is going to be viable, it's going to need to build up a critical mass of creatures, and then inflict significant, crippling damage over the course of one or two mid-game turns. Well, we've stumbled out of the gate. Aqua Trickster is the definition of underwhelming. 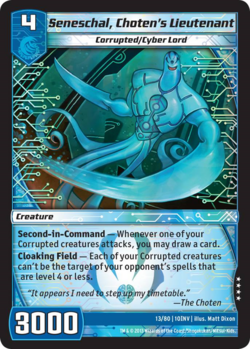 Since we know his Aquan race will be of no consequence, he's basically a (gulp) worse [ccProd]Cybergrid Bandit[/ccProd] at first glance. Still, the central idea behind Corrupted creatures is that each one grants abilities to all Corrupted creatures we control. The potential is certainly there for Aqua Trickster to be more than worth the 2 mana investment, depending on what kinds of abilities we can grant him. We'll come back to him later and re-evaluate once we have more data. 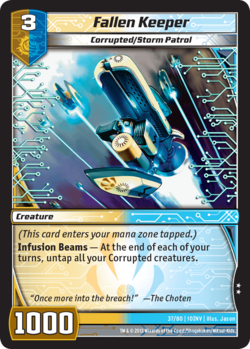 Skyvolt Mech is a decent card. 3000 power is above average for a level 2 creature, but level 2 vanilla beaters haven't seen a lot of play thus far. The power curve for blockers ramps up much quicker, so these guys are quickly outgunned. We may want him if we need Light sources, though. Bronze-Arm Renegade immediately draws me in. He's a larger [ccProd]Manapod Beetle[/ccProd] that grants all your Corrupted creatures the "mana infused" effect. 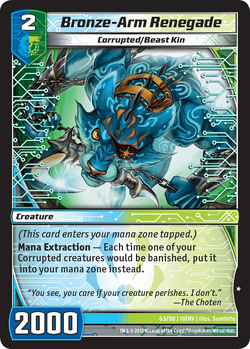 Since he's a level 2 creature, we assume there will be larger threats the opponent would rather kill with his or her removal, but the Renegade makes those choices not as clear-cut, which is always a plus for a deck that wants to be attacking with smaller creatures. Judging by the 2-drops alone, our early inclination is to venture into Nature. Some more familiar abilities, but cranked up to 11. Fallen Keeper [ccProd]Regroup[/ccProd]s your team every turn, which is a very underrated effect in this game. 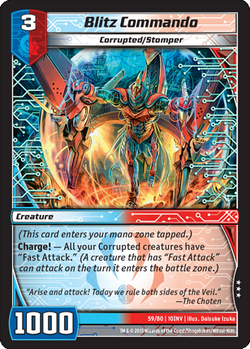 Being able to attack without fear of crackbacks (or being able to attack and then block on the opponent's turn) gives you a lot of flexibility in the battle zone, and you're not always afforded that level of choice in Kaijudo. That being said, I'm still not convinced that I want to branch into the Light civilization. I need a card that really wows me. The 1000 power on Fallen Keeper is a huge downside. You're already making yourself susceptible to shield blasts, gaggles of blockers, and [ccProd]Herald of Infernus[/ccProd] if you're a small creature deck that wants to attack. It's a real liability to be playing too many tiny creatures in this style of deck. Especially if you want to play 2, 3, or even 4 colors! It's just not feasible to play off-curve and discover that the best you can muster is a standalone Fallen Keeper. You'll get eaten alive. Essence Shade is alright. He's basically an [ccProd]Essence Elf[/ccProd] for one more mana that only pumps Corrupted, but he counts himself among that number. 3 for 3000 isn't remarkable, but it's on curve. Why wouldn't I just play [ccProd]Essence Elf[/ccProd] instead if I already want to be in green, though? 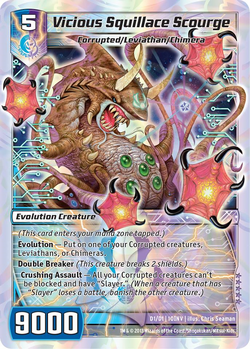 Well, that might be a true sentiment, but we have to remember that a Corrupted creature is always going to be better than its non-Corrupted counterpart for us, since it will presumably be "imprinted" with another effect or two while in play. The main consideration is whether or not we can support the civilization, or the number of splits. Our first Rare card, Blitz Commando, is a powerhouse. A multiciv [ccProd]Jet-Thrust Darter[/ccProd] that makes every one of your Corrupted creatures able to Fast Attack is not to be underestimated. I continually toy around with [ccProd]Hyperspeed Dragon[/ccProd] and [ccProd]Steamtank Kryon[/ccProd] brews, because threatening continued Fast Attacking is one of the most powerful things you can do in this game. Do we necessarily want to start coming in and attacking on turn 3 or 4? Maybe, maybe not. Still, he's just floating out there for a paltry 3 mana investment, and the opponent can't afford to leave him alone. He's certainly good enough that I want to consider Fire. Seneschal, Choten's Lieutenant is exactly what we want in a level 4 creature. Sure, he won't help to unlock any of our inevitably lesser-played colors, but we will probably end up needing to play every monociv creature we can get our hands on. We know how powerful [ccProd]General Finbarr[/ccProd] is on turn 6, and the new Seneschal can achieve similar results even earlier. Toss in invulnerability against the likes of [ccProd]Bone Blades[/ccProd] and [ccProd]Piercing Judgment[/ccProd] for your whole team, and it's clear: there's no reason not to be playing the full 3 copies. Oh, Ballistic Skyterror. You couldn't have had some marginal effect? Is 5000 power on a level 4 multiciv creature really that strong? One of two things has to happen here -- either we need to include this guy to have enough red to support Blitz Commando, or we need to seriously re-evaluate our desire to play Fire cards. He's fine...but we're getting up in the curve now. We can't settle for fine at this stage. Bad Apple has a lot of play to it. Turning everyone into a [ccProd]Razorhide[/ccProd] is dangerous, for sure. Of course, since we're a low curve creature deck and we're not ramping toward anything in particular, Bad Apple's Scattered Seeds ability is only exceptional when you also control Seneschal. If you have a fresh hand of cheap threats to dump onto the field on the following turn, you'll want all that extra mana, but otherwise it could be unnecessary. We'll have to reserve judgment until we see the higher level Corrupted creatures. The Rotten to the Core effect is very intriguing, though. Bad Apple turns all our Wild Veggies into Corrupted creatures, which could potentially double the number of "Corrupted" creatures available for inclusion. This could also be a nice way to get more monociv creatures into the deck without diluting our Corrupted count. A lot of the current Wild Veggies are either underwhelming ([ccProd]Karate Carrot[/ccProd]), or cute ([ccProd]Shaman Broccoli[/ccProd]), but if we staple on Corrupted effects they may be worth a second look. The brand new "hexproof" 3-drop, Tricky Turnip, could be just the 3-drop we are looking for. Bad Apple is a top contender for sure. Sticking with Green, I could easily see playing Tainted Quartz. I like him a lot better than Essence Shade. Yeah, he costs 1 more, but +2000 power across the board is no slouch. If we decided to play Blue/Red/Green, making Ballistic Skyterror 7k is tantalizing. Whether or not we play the Quartz is dependent upon what the rest of our Nature looks like, but he's certainly up to snuff. We have a myriad of options here at the 5-drop slot. 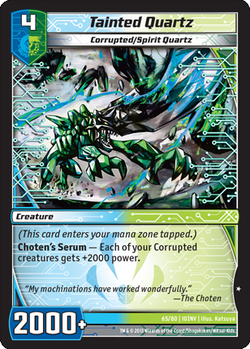 Choten's Stalker Sphere is very, very bad. A 5 for 3k multiciv is brutal. Turning your whole team into blockers is irrelevant in this deck. None of your W/L creatures are bigger than 3000 power! What, are we going to play Bant colors and try to hang back with 5 and 6k blockers? What is that really achieving? There's absolutely zero reason to play this guy. On the other end of the spectrum, Luminar Unleashed is a very good card. We know how flexible [ccProd]Blinder Beetle Prime[/ccProd] is -- he has playable bait, comes down at a key spot in the curve, and can serve as both an aggressive game-ending push, or as a surprise revenge kill. Luminar Unleashed has a lot of these qualities as well. 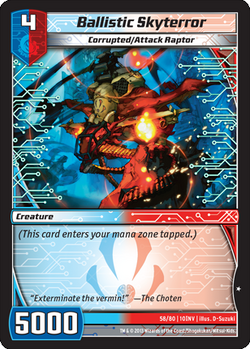 While he doesn't tap a creature immediately upon entering the battle zone, he does turn all your Corrupted creatures into [ccProd]Shaw K'Naw[/ccProd]s. It's not hard to take control of the board with his ability. Your initial attack may have to target a shield, though, which could foil your best laid plans. Luminar Unleashed is also a multiciv card, and we don't want to bog down the entire top end of our curve with splits. He's not as dynamic as [ccProd]Blinder Beetle Prime[/ccProd], but he may be worthy. Still, Light seems like the weakest team-up so far. It'd be nice if there was a big fat Evolution creature in another color. Speak of the devil -- Vicious Squillace Scourge earns his namesake and then some. He's a bruiser, plain and simple. 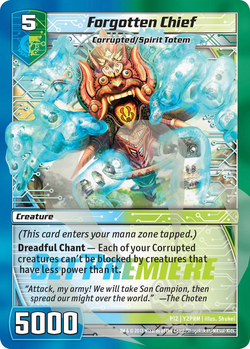 An unblockable 9000 power Double Breaker already puts [ccProd]Aqua-Ranger Commando[/ccProd] to shame, but he also, of course, opens to floodgates for your entire army of evil by granting Slayer across the board. 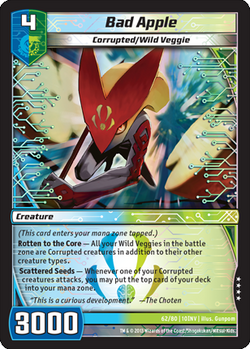 There's no way for your opponent to profitably interact with your board on either offense or defense while Scourge sits in the zone. 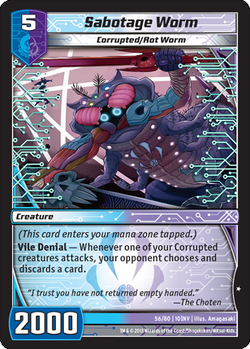 Taken purely on his own terms, Squillace is a creature we surely want a full playset of. Our Darkness options haven't blown me away so far, though, so ol' Squills isn't an instant inclusion just yet. Sabotage Worm has a dangerous ability, so I can understand why he's powered and costed like he is. Wizards of the Coast wants to err on the safe side with abilities like this, since losing your entire hand without warning can be a very negative experience. Still, he's simply too small to make me feel confident about him. If you build up your board and then discard your opponent's whole hand, then he's essentially forcing your opponent to play on your level, which is cool. Control decks can't really stand up to a continuous assault if they don't have large threats in hand that they're building toward. They might be able to revenge some of your creatures on the swingback, though, which could buy them enough turns of "mana, go" to top into an answer. He's also in Darkness, and considering Essence Shade is the only other non-Evo released, I don't feel like Sabotage Worm is flashy enough to make me want to commit to the color. Forgotten Chief is nice in that it gives Water/Nature a strong backbone all the way up the curve if need be (assuming Tricky Turnip on 3). If for some reason you felt it necessary to play a two color Corrupted deck, he'd make the cut. 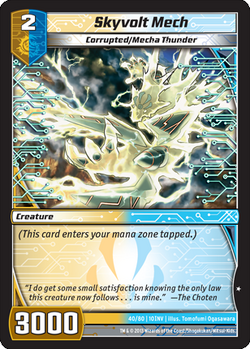 He's pseudo-unblockable, and might allow one of your other creatures to get in as well, but the Chief underwhelms for the most part. His existence does reinforce that I really want to be playing Nature, though. Enslaved Flametropus breaks the mold a bit, for reasons unknown. 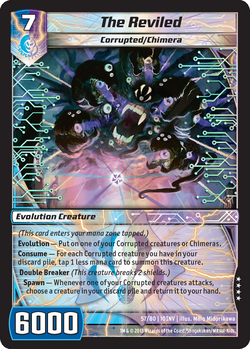 Rather than granting all your Corrupted creatures a bonus, he himself gets a sizable bonus if you only control Corrupted creatures. Essentially, an inverse [ccProd]Flametropus[/ccProd]. If he comes in Fast Attacking off a Blitz Commando, he's quite scary, but he might be a little too fragile for our tastes. If you're playing Wild Veggies with Bad Apple to up your Corrupted count, you could run into feel-bad experiences where he's a worthless 5 mana 4k William. That's just not powerful enough for what we want to be doing. We're out of the realm of little guys now, and General Charzon stands alone. There's not much to be said here. If you're playing Fire, you're playing Charzon. Slam him down, make your field a bunch of worldbeaters, and hope you win from there. 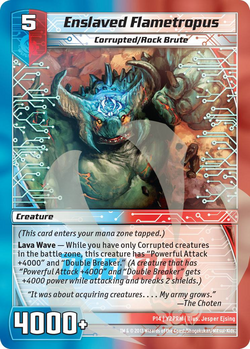 We probably don't want the full 3 copies since he's a little topheavy, but if we're in Fire he's an appealing Evolution in place of Vicious Squillace or Nu-Luminar. The Reviled being listed in the Level 7 section is a bit of a misnomer, since his main draw is his cost reduction ability. It's not unheard of that The Reviled costs you 5 mana, which is good because his 6000 power is a tad weak otherwise. I want my Evolutions to be able to attack over Lyras! 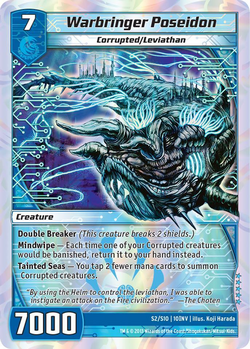 His Spawn ability lets you gain back some card advantage and keep the Corrupteds rolling, but I'm not sure we want to be banking on having a bunch of Corrupted cards in the bin anyway. We don't want to play all 5 colors, so our Corrupted inclusions are at a premium. We want them to survive to grant their abilities for the final assault. In addition, The Reviled is an awkward mesh with a Corrupted build playing Nature, since Bronze-Arm Renegade keeps your creatures out of the discard pile. 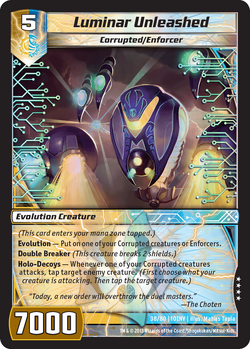 Vicious Squillace Scourge is a much sturdier Evo option in Darkness, and I can't imagine a deck that wants both of these guys. Warbringer Poseidon brings us home. There's a case to be made that we want to play all possible single-civ Corrupted creatures, but 7 mana is a little steep for our deck. Both his abilities are very powerful, though, so if we find that we want to play Bronze-Arm Renegade and Bad Apple and we're consistently making it to 7 mana, we could do a lot worse than the Warbringer. 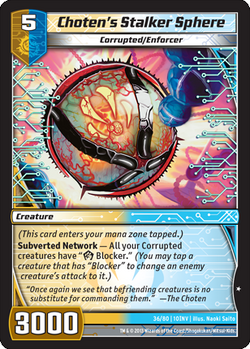 It's easy to put your opponent in a bind with his first effect; it's a losing battle for your opponent to Shield Blast their way out of the line of fire, unless of course they hit a [ccProd]Root Trap[/ccProd] or something. Warbinger allows you to replay those bounced cards for a fraction of the price and continue without missing a beat. It's also nice to have the option to play a Fast Attacking Double Breaker that doesn't lose us a creature on board if we control Blitz Commando. I like this card a lot, but we may find out that we either don't have enough room, or his cost is prohibitive. If we're able to untap with him, I can see him getting out of hand. These creatures stand above their peers at their respective levels. We haven't identified any transcendent Light creatures here, so it's safe to say we can eliminate Light as a team-up color for our first attempt. Do we play WFN? WDN? Is 4 colors possible? We'll delve into these questions next week, and get to work on constructing an initial build. Be sure to get your first taste of the Corrupted menace at your local Invasion Earth Set Premiere event this weekend! Gather your forces and prepare well, because you can't miss the Circuit Series when it comes to Worcester, MA on November 16-17! Invasion Earth will be legal, and this event will be sure to influence the Winter Championship! Until next time, Play Hard or Go Home!